As journalists, we’re constantly looking for smart minds in academia, who can help us—and thereby our readers—understand complex phenomena. Whether it is unravelling the pricing of telecom spectrum, or how India can play catch-up in electric vehicle technology or indeed what makes a few Korean chaebols a runaway success in India. 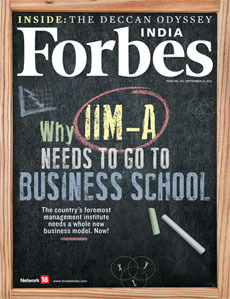 In the three-odd years that Forbes India has been around, with just a few honourable exceptions, my colleagues and I would be hard-pressed to find a voice of authority inside the hallowed portals of India’s premier management institute, the Indian Institute of Management, Ahmedabad. True, the institute does not exist to serve the needs of journalists. But if its research output does little to advance the pursuit of knowledge and new ideas, there’s every chance that India and its entrepreneurs will be poorer for it. As a country, we need new ideas to solve complex challenges in education, healthcare and to make our entrepreneurial ecosystem a lot more vibrant. Sadly, much of that debate is driven by research emerging out of global business schools, while IIM-A stands as a mute spectator. Over time, losing thought leadership can be telling. Students end up learning concepts that are out of sync with life outside campus. Or case studies tend to be about corporations that have ceased to exist. And that wonderful triad—of consulting, research and teaching—that feed into each other simply breaks down. IIM-A now has a real chance to change the equation. A search committee, led by the new chairman of its board of governors, L&T’s AM Naik, is looking for a new world-class director. After all, an institution is only as good as its leader. Our cover story by Deputy Editor Shishir Prasad offers an insightful account of why IIM-A needs an urgent shake-up. It is a must read, if you believe in the larger cause of management education in this country. Before I sign off, two important announcements. One, I’m pleased to say we are now available as an e-magazine on tablets via Magzter store for both Android and Apple tablets and we will soon have our own dedicated newsstand app on the Apple iPad. Two, we’ve launched the Forbes India Philanthropy Awards to recognise entrepreneurs and business leaders who have taken the lead to give back to society. (Details on http://forbesindia.com/awards/philanthropy) This is an initiative I’m particularly proud of because it will fuel more conversations and actions about how to make business a force for good in our society.